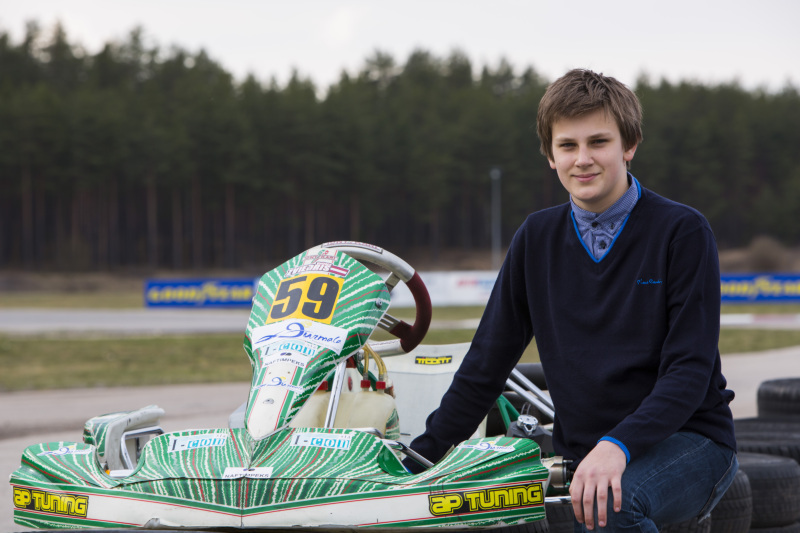 Latvian kart racer Valters Zviedris this year will represent Latvia at the International Automobile Federation Karting Commission (CIK-FIA) Karting Academy. Valter characterize his chances as very good, which means that the Latvian word in Europe will not be ashamed. The event will take place in three stages. First in France, Esse track (21 to 24 April), the second in Portugal, Portimao track (23 to 26 June) and the final stage in Sweden, Kristianstad (September 1 to 4). Valters competition for the main prize - a paid place in one of the leading teams CIK-FIA World Championship for juniors to 20 November, will be played in Bahrain, Sahir track, account for 51 participants from 38 countries. CIK-FIA Karting Academy is unique in that all participants starts racing with one manufacturer's equipment - OTK Group Expirit Kart with Vortex OK Junior engine. Kart frames participants raffles for all three stages, but the engines - for each stage separately. This means that competition in the fight for victory is made similar to the maximum, because the winner will determine the driver's talent, teamwork skills to regulate the sale in accordance with the track characteristics and requirements of the athlete. Athletes age - from 12 to 15 years. Valter’s father and manager - Aigars Zviedris emphasizes: "The task is not easy, but we will work and fight with the aim to win or at least get the best possible results in each of the three series stages. Swedish track for Valter is known. In the last year, in 32 athletes in competition Valter won 6 place Swedish Rotax Max V stage. " Valters Zviedris until now can boast of a two-fold Latvian karting championship title in 2009, the Micro class and in 2015 Rotax Max Junior category. In addition to these titles Valter’s has a number of Latvian and Baltic championships medals in each of the karting season spent in learned race victories and awards. This season he has started already last week in Belgium, Genk track, which took place in Rotax Euro Challenge series first stage. In hits Valter finished 13th, 9th and 10th place, but pre-finals fought in the top ten, but suffered a crash. The event managed to continue and reach the finish line, after a penalty 29 seconds of receiving the ranking position. Valter finals of the last positions fighted until the 20th place, but then the race was excluded, unauthorized overtaking maneuver due to the use. Currently, Valter has returned home and is actively preparing, perhaps, so far his career with the important start - the International Automobile Federation Karting Commission (CIK-FIA) Karting Academy for the first phase - in France, Esse track. We keep our fingers crossed! Video interview with Valters Zviedris and his father and manager Aigars Zviedris before the upcoming launches worldwide International Automobile Federation Karting Commission (CIK-FIA) Karting Academy - Annex.